The urban revival that has led to an economic resurgence in New York City has bypassed many of our smaller cities. These centers—places like Paterson, Poughkeepsie, and Bridgeport—have continued to struggle in the post-industrial era to build and attract businesses, and achieve the prosperity that comes with them. But these older job centers are positioned to once again become significant providers of employment and homes for local residents, and help generate an era of sustainable economic growth in the region. States and regional authorities should focus resources in these cities and reform programs that inhibit private investment. Local leadership should implement comprehensive economic-development strategies to ensure existing residents benefit from job growth and new development. In the second half of the 20th century, the suburbs attracted nearly all of the region’s job growth, in the form of office parks and malls. More recently, nearly all the job growth has taken place in New York City. Neither cycle benefited most of region’s small and mid-sized cities. Many poorer villages with sizable downtowns, such as Hempstead, NY, have similarly been been left out. These centers have been left without the tax base needed to provide robust municipal services and upgrade infrastructure—and their residents have seen their incomes stagnate for more than 30 years. Declining downtowns and fewer industrial jobs contribute to a vicious cycle that also includes population loss and more concentrated poverty. Despite the region’s population having grown by more than 20 percent over the past 50 years, including New York City gaining over 650,000 people, the next 10 largest cities have actually seen their combined population fall by more than 100,000. In many ways, these older job centers are extraordinarily well positioned to rebound. Despite their relatively dense environments, many are well below their peak historical population and have the space and infrastructure to handle substantial population and job growth. Many have vacant or underutilized land and buildings that could become home to new, green industries and businesses. Their older street grid patterns and neighborhood character offer the potential for the type of walkable neighborhoods that are critical for future growth—and that are in such popular demand today. They already have the water and sewer systems, the roads, the schools, and the other basic infrastructure necessary for dense communities. Many are served by commuter rail, giving them good access to the Manhattan jobs engine. And new transit infrastructure, like better regional rail and on-street transit, can provide the connectivity necessary to thrive. With the right investments and policies, these older centers could add 360,000 jobs and grow faster than the region’s economy as a whole. Several cities in the region have already benefited from these physical assets and intentional revitalization efforts pursued by local governments, businesses, and civic leaders. 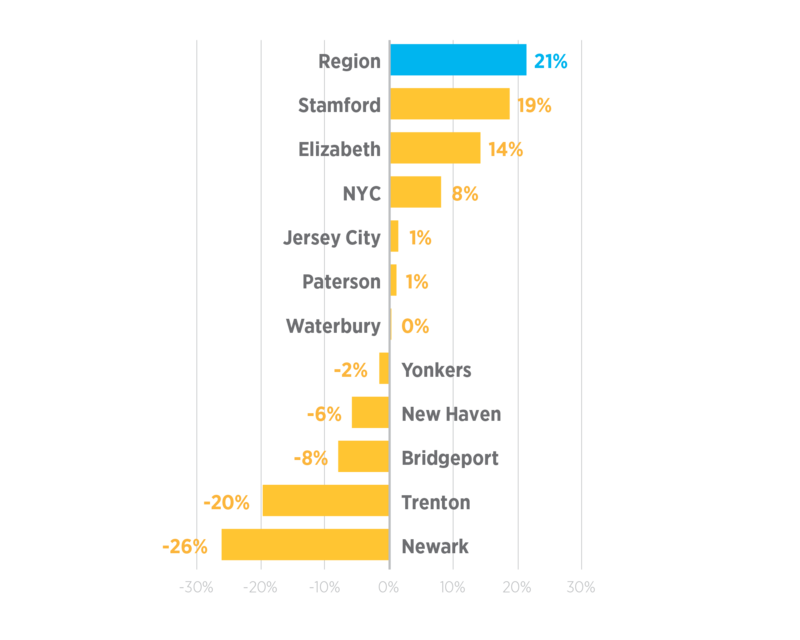 Stamford, Jersey City, and White Plains have experienced both job and population growth, led by mixed-use downtown development near busy transit hubs. Others, like Newark, are seeing their downtowns finally turn around after years of strategic planning and major investments. In nearly every instance, these places have benefited from easy transit access to a growing New York City economy, and significant support from state-government and regional transportation agencies. One challenge is bringing this prosperity to all the residents of the cities where new development takes place. Too often, the redevelopment of a downtown fails to improve conditions or economic opportunities for people living there or in the surrounding neighborhoods. Another challenge is bringing this prosperity to a larger number of places—particularly the smaller, isolated cities, and places where public safety, schools, and housing quality are seriously deficient after decades of disinvestment. Turn environmentally burdened neighborhoods into healthy communities.Each city requires its own unique strategy—and effective leadership based on a shared vision is critical. These strategies would have the greatest success when the cities use their existing urban form to create vibrant downtowns and districts; build on the strengths of neighborhoods and not just downtowns: and partner with private and nonprofit institutions to give residents the skills and access they need for stable employment and well-paying careers. But restoring and strengthening these places would not be the job of the municipalities alone. Although state and federal policies were primary causes for the decline of cities and older suburbs, they would need to take a lead role in providing the infrastructure, rules, and support for their cities’ revival. Counties would also have a major stake in the success of their cities, and collaboration would help both take advantage of the rising opportunities for regions with thriving downtowns. Walkable neighborhoods produce more jobs and economic output, expand opportunity, and reduce combined housing-transportation costs for their residents. The cities in the region with the most potential to become job centers are typically older cities with the compact street grids and mixed-use character that can, with some attention and investment, become safe, active, and walkable neighborhoods. But for these neighborhoods to reach their full potential, local leaders need to promote the rehabilitation of smaller mixed-use buildings, encourage population growth to support new businesses, and make the streets safer. Street design improvements should include protected bike lanes and sidewalk expansions, while successful green streets programs should be expanded to cool city streets. Most of all, local leaders must resist large-scale urban redevelopment projects, which can destroy the walkable character of a community and displace existing businesses. State historic tax credits make it easier to leverage federal and private funds for the rehabilitation of properties in several historic downtown neighborhoods. New Jersey should institute such a program, and New York and Connecticut should expand theirs. Federal financing regulations that prevent many types of mixed-use development and rehabilitation should be reformed. Lastly, the three states, industrial-development authorities, and redevelopment authorities should adopt or expand loan-guarantee programs for both local business development and housing. Older cities have a diverse array of neighborhoods and communities. Some areas suffer greatly from disinvestment and abandoned and deteriorating buildings, while others have low retail-vacancy rates, healthy local economies, and active communities, even when the population is predominantly low-income. These types of neighborhoods already provide jobs, business opportunities, and community for existing residents. While better municipal services, economic opportunities, and protection from displacement are needed in virtually all low-income neighborhoods, municipalities should focus redevelopment on places where it can have the most impact—the truly blighted areas that are most in need of change—especially as this type of investment is more likely to lead to increased job opportunities for the local population. In areas where there is already an existing job base, the public sector should focus on supporting existing economies and growing local business. For example, Paterson, NJ, has demonstrated the possibilities of building on existing assets such as arts, recreation, and small immigrant-owned businesses. The physical redevelopment of regional centers should be undertaken, when at all possible, by smaller local contractors and developers in order to grow and build a base of local employers. Cities could adopt policies that give limited tax incentives to companies that commit to specific job and wage targets, preference to local university graduates, or incentives to workers who live in these cities. The cities that are home to large universities, hospitals, and other anchor institutions should collaborate with businesses to improve neighborhood conditions and help train and place workers neighborhood residents in a growing job base. Improving commuter rail and other forms of suburban transit is critical to revitalizing these cities and turning them into job centers. In the short term, this means funding the transit agencies adequately and improving the level of service. In the longer term, turning the region’s fragmented commuter rail system into a regional rail network that is better able to help workers commute into regional job centers, and not just into Manhattan, would also make these centers far more competitive. RPA’s proposed Trans-Regional Express would drastically cut commute times to many of these centers from anywhere in the region—dramatically increasing their potential as job hubs. Places that do not have easy access to Manhattan, like Newburgh or Danbury, should invest in bus and other on-demand connections to the commuter rail network. Sometimes, it’s the government’s own regulations and institutional structures that hamper the growth of these cities. Although developers could build more affordable and middle-income homes, create active commercial districts, and support competitive industrial jobs, such development is simply too expensive. State-level actions that could help bring development costs in-line with demand include reforming the development approvals process to make it more predictable, giving cities the ability to reduce property taxes and raise revenue from other sources, reducing municipal school costs by creating regional school districts, coordinating or consolidating services with other municipalities, and providing more funding for brownfield remediation. As cities grow, they need to make sure they put in place policies that ensure everyone benefits, especially existing residents. Wage growth should not be taken up or exceeded by cost-of-living increases in the form of higher rents or more expensive goods and services—and new housing should be for more than just the highest earners. Newark is an example of a municipality that has adopted strong inclusionary zoning policies while also encouraging more growth. Worker- and community-owned business cooperatives, which have operated successfully in Minnesota and other states, and are under consideration in places like the Bronx and Newburgh, can be an effective way to capitalize on local expertise and resources to build and keep wealth within an existing community while reviving the city as a whole. Jobs are not close by. There are very few direct hires. Employers are using contract agencies to screen. Wages are low. And the contracts don’t last that long. Positions end in six to eight months. Creating a network of growing job centers that increase incomes and opportunity for those who live in them would be a game changer for the region. It would decrease inequality and generate tax revenue that could be reinvested in schools and services. Encouraging job growth outside the urban core means reducing commute times and improving quality of life for nearby residents. The dense and walkable infrastructure and lower market and construction costs would lead to more affordable homes near jobs and amenities, saving people significant time and stress. And by making sure this growth is equitable, and targeted to places that truly need investment and development, both new and existing businesses can thrive and build off of each other. Restoring our regional job centers would have up-front costs but large returns. Investments in infrastructure are needed in these centers for commuter rail, bus, streetscapes, and other municipal improvements. Especially in the poorest municipalities, county, and state funding should provide for the initial investment. Some incentives to attract new businesses would likely be necessary as well, although they should be limited and targeted toward local-job and wage growth directly. In the long run, these initial public investments would leverage much larger investments by private businesses, and create exponential returns. Overall, restoring our regional job centers would result in significant revenue for municipalities, workers, businesses, and the region at large.